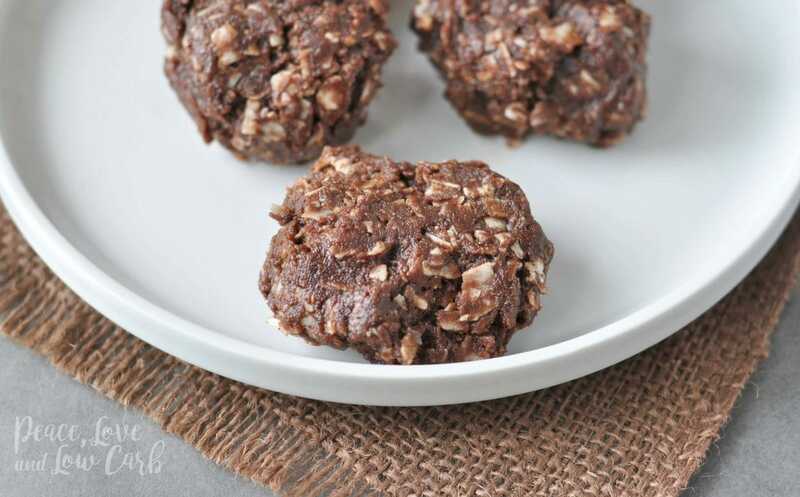 Sweet, crunchy and portable, these keto no bake cookies are the perfect low carb treat. 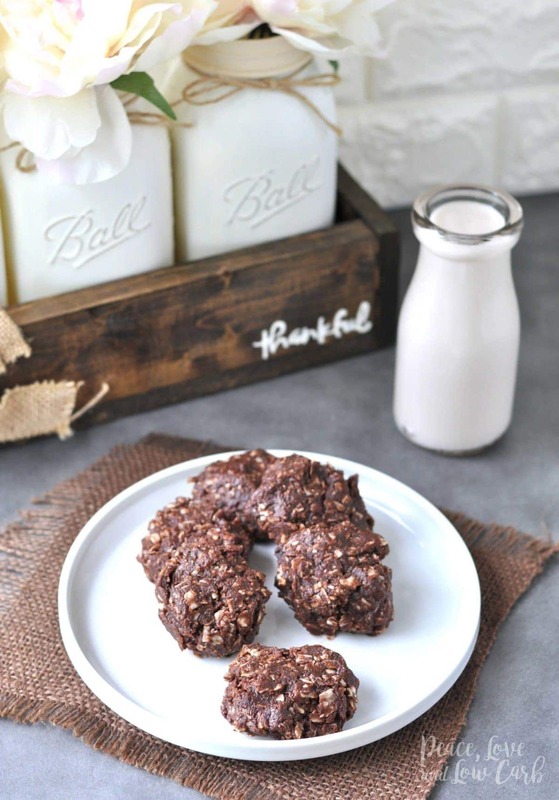 A quick and easy low carb cookie recipe that is sure to be spouse and kid approved. It doesn’t get much easier that mix, chill, eat. As a child I remember a neighbor always making haystack cookies and it was always such a treat. Sometimes she made them with oatmeal and other times she made them with crunchy chow mein noodles. The chocolate butterscotch chow mein version was always my favorite, and since I only had them on special occasions, it always felt like an extra special treat. I can almost taste them right now. 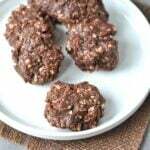 With this low carb haystack no bake cookie recipe, I used unsweetened desiccated coconut to give it that familiar no bake cookie crunchy texture. If you can’t find unsweetened dessicated coconut, you can buy unsweetened coconut flakes and pulse them in a high powered blender or a food processor to get the desired size. With fall rapidly approaching, people are already asking for low carb Christmas cookie recipes. Well, in my book, any low carb cookie recipe made around Christmas is a Christmas cookie. 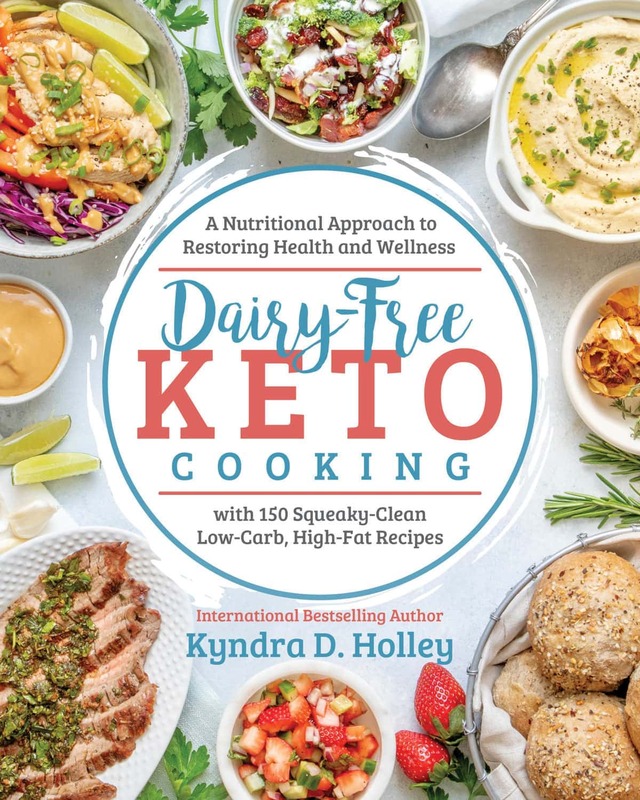 🙂 That being said, here are a few of my favorite keto cookie recipes. Keto Flourless Chewy Double Chocolate Chip Cookies and Low Carb Chocolate Peanut Butter Bacon Cookies. 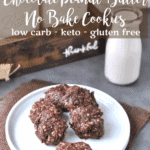 Another great thing about the low carb no bake cookies is that they don’t use any egg like a traditional recipe. That makes them a great dessert option for those with egg allergies or intolerance. In a mixing bowl, combine the peanut butter, almond butter, and cream cheese. Mix until smooth. Add the butter, vanilla extract, cocoa powder. and erythritol. Mix until all ingredients are well combined. Using a rubber spatula, fold in the coconut. Mix until it is evenly distributed throughout the mixture. Drop 1 1/2 to 2 inch spoonfuls (10 total) onto the prepared baking sheet. Freeze for 10 minutes before serving. Store extras in the freezer until ready to eat. Cookies are approximately 2.5 net carbs with the ingredients I used. I added some chocolate chips. Hoping to take these on longer bike rides, hopefully they don’t melt too quickly. Totally agree! I may use unsalted butter next time to up the natural sweet factor but batter was deelish!! These are delicious! Thank you for sharing such a tasty recipe. I’m not a big coconut fan—it’s okay but…would hemp hearts work here or do they need to be baked? I substituted ripe banana and 1 tbls of chia seeds. Delicious! I’m one of the few weirdo’s that doesn’t like the taste of coconut and chocolate together. Do you think almond or pecan pieces would be an ok substitute? I haven’t tried it with any other combination. However, the coconut flakes are what gives it its bulk. If you try it with nuts instead, be sure to report back about how it worked out. I don’t like coconut, so I crush almonds and use those. We love them! I am not a fan of coconut so I substituted with almond slivers….so good! What could you substitute for the erythritol? You can use any low carb sweetener you prefer. I used confectioners munkfruit and they turned out amazing! The only sweetener I use is stevia. The trick is to find a really good brand of liquid stevia, and then you’re set. Think Heath food store, not grocery store. Trivia and “stevia sweet” both taste bitter to me. I use a brand called “better stevia” and it really is better for some reason. Probably I’d use about 20-25 drops of stevia for a recipe like this! What do you do when you’re baking? I thought replacing a granulated sweetener with stevia would ruin the consistency and it wouldn’t bake properly? And I haven’t been able to find granulated stevia that isn’t cut with erythritol. I LOVE, LOVE these cookies. They have to be my favorite (low carb or not) hands down. I had all the ingredients and they were quick to make and I didn’t have to wait along time to try them. Thank you for this recipe. These cookies will be made A LOT! These were quick, easy and delish! Thank you! These were delicious and very easy to make. My 2 year old Grandson helped me make them and when they came out the freezer, he said “cold”, he loved them. I will make these again. Just want to ask one thing, the serving size is 1 cookie? These are delicious!! Like another reader I realized I had all the ingredients except almond butter . I got right up and made them! Thank you???? Great recipe! Love the cookies!! Do you know how many calories per 1 inch serving? Do you taste the coconut? I was out of coconut and searched the pantry for a substitute and found hemp hearts! Fills the oatmeal spot perfectly! Did you use the same amount called for with the coconut to sub in the hemp hearts? I just made some and used hemp seed and just used 3/4 of seed and it was great! These are so good and easy to make. My son loved them! Loved them! Had to double the peanut butter since I didn’t have almond butter though. Next time I’ll sub half the coconut for almond slivers. My husband loved them as is! I haven’t tried it yet but wanted to know from others that have made them if they do ok sitting out of the fridge. Do they get sticky or melted? I want to bring to a bake sale, but not to f they are going to be a melty mess being out in a possible warm environment. These are so so delicious! My husband and I can’t get enough of them! We have been doing low carb for a while now and i made them as soon as i discovered your recipe online. Thank you so much! I thinking I might have to try these tonight but minus the cocoa…because while chocolate is good, I’m craving a more PB/butterscotch sort of version…hope it turns out well! These sound so easy and I have everything on hand! I’m going to make them soon. Ooh, keep us posted on the butterscotch version! Thanks for the recipe! It’s great to have a sweet treat to keep me on track. I didn’t have peanut butter so I doubled the natural almond butter (which was a bit coarse) and it worked out nicely since I didn’t have coconut on hand! I think any variation of this recipe would be delicious! ???? These are so easy to make and delicious. I have a crazy chocolate addiction so I added a few sugar free chocolate chips. I lightly toasted the coconut and saved some to roll them in. Great recipe! 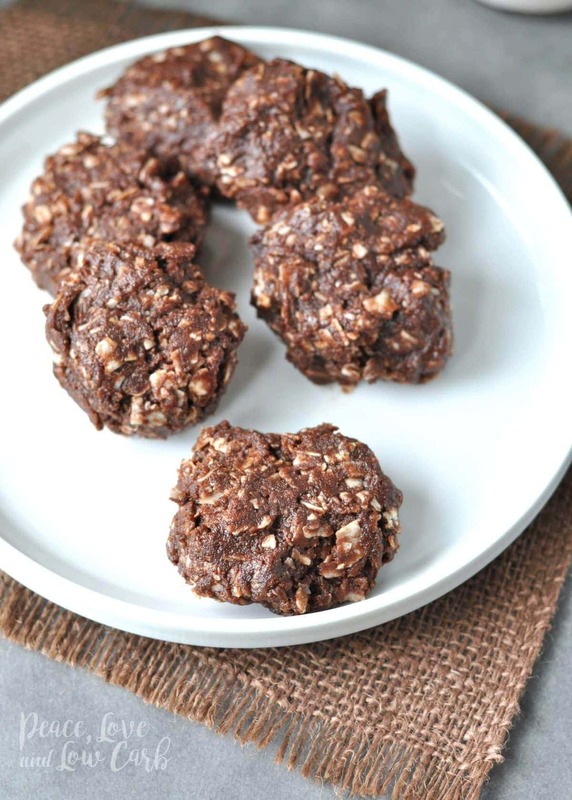 These no-bake cookies are delicious, and super easy to make. When I make a batch, I like keeping some in my lunch just in case there is no time for a break.at work. Once I was out of almond butter and creamy peanut butter, so I just subbed a 1/2 cup of crunchy natural peanut butter, and used shredded unsweetened coconut. Instead of cocoa powder, I added peanut butter powder and several drops of caramel stevia. Amazing! These are soooo yummy! Thank you for the recipe. ???? I haven’t made these yet, but as soon as I finish this note, I just might have to! I’m wondering if microwaving the PB, cream cheese, etc, wouldn’t make it easier to mix the ingredients. I think that that is how I’ll do it–at least, for the first time. I love the idea of adding some nuts or hemp or other wonderful things. Yup, gotta make ’em right now! Thank you for all of your wonderful recipes! These are great! I’m so glad I found you!! Used regular erythritol and they turned out great! Thank you for the recipe! This is my new favorite! Love love love this recipe! I make them into little round balls and store them in the freezer. Today’s batch I added ground walnuts. Made ‘em-love ‘em! So easy and SO good. I added some chopped pecans, chia seeds and I used Monk Fruit instead of Eriythritol. Hard not to eat them all in one swoop! You’ve done it again Kyndra! Thank you!!! Loved these…may have waten too many, lol. I subbed coconut for almond slivers and the texture was divine! Thanks for another good one! Just made these and I love them. Only problem they are too good will be hard to limit the number I eat. These are some of the best low carb cookies I’ve had. The only changes I made were to add Lilly’s dark chocolate chips and pecan chips. One cookie is enough to satisfy my sweets cravings. Super easy to throw together and absolutely delicious! I only had chunky natural peanut butter, but the extra texture was nice! I wonder if just a tiny bit of sea salt on top would enhance it even more!?! Every recipe of yours has turned out fabulous! Thank you!!!! Just watched your entire video and thoroughly enjoyed it. Thanks for being real!! !